This book has been on my "to read" list for over a year now. Must now actually get round to reading it. 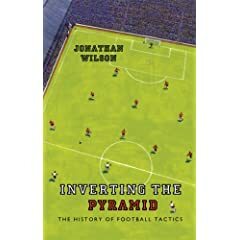 Really enjoy Wilson's comments both in the Guardian and on the Football Weekly podcast so it's no surprise that he has put together a well written book. I've ordered this book some weeks ago recommended by others. It seems I won't be able to get it until March! I'm interested in your perceptions of the book, Mikey. Good idea to put it on your blog. What's the howler on page 297? Is that you, Mr. Wilson? In which case, allow me to compliment you once again on your excellent book, and the always informative Guardian blog! Sweden did qualify for the 1970 WC. Quite right: a howler. Sorry. I suspect I probably intended to write 'qualify for the quarter-finals of the 1970...'. But I didn't. Thanks for letting me know. At least the Dutch edition will have it right.